What Happen to Your Body after drinking Coke in 60 minutes? photo credit: Mmm, delicious, but is Coca-Cola also destroying your body from the inside? Alexander You’ve seen Coca-Cola mixed with molten lead, dropped into liquid nitrogen and even consumed by a river of molten lava. But what happens to your body after you’ve drunk the sugar-laden beverage? After reading this, you may reconsider picking up a can. 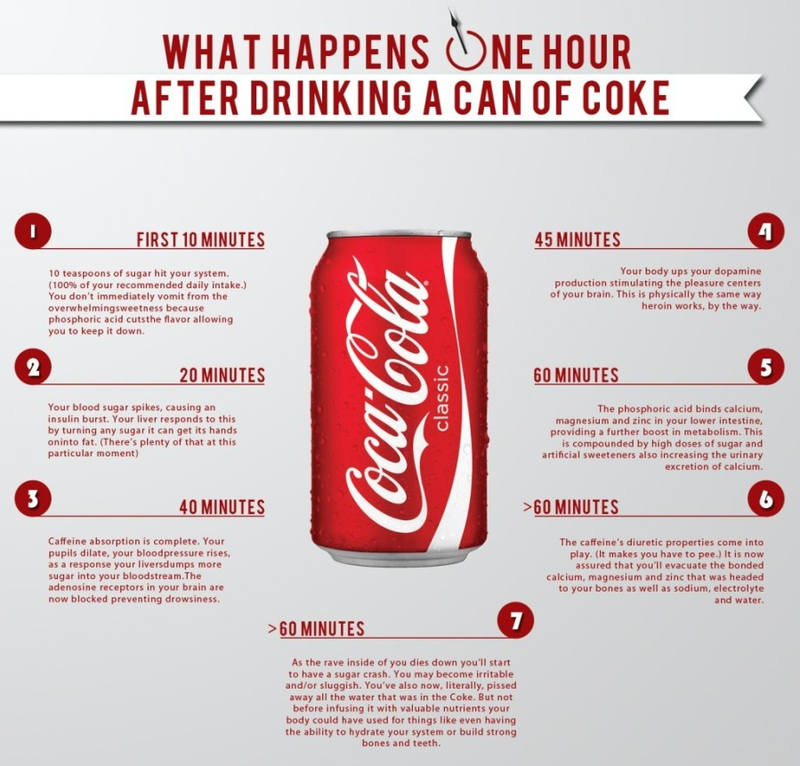 This infographic, created by Niraj Naik of The Renegade Pharmacist last month, claims to describe how the sugar, caffeine and other ingredients contained within one can of Coca-Cola affect the body an hour after consumption. Based on this post by Wade Meredith on Blisstree, the facts seem legitimate - until you focus in on the actual figures used. For example, as one commenter points out over the "40 minutes" claim, it is highly unlikely that one serving could make the pupils dilate within this timeframe. Although a can of Coke has 34 mg of caffeine, a stimulant capable of triggering the release of adrenaline, this is significantly less than what you'd find in a large coffee, which can contain as much as 200 mg. In fact, without any figures backed up with sources or real data, these claims appear to be a attempt to alarm Coca-Cola drinkers without much substance. We already know that the drink is not healthy, but Naik is determined to help people to change their consumption habits in order to benefit their bodies in the long term. "I discovered that a trigger factor for many widespread diseases of the west such as obesity, heart disease and diabetes could be closely linked to the consumption of one particular substance found in many processed foods and drinks – fructose in the form of high fructose corn syrup," said Naik on his website. "High fructose corn syrup is found in pretty much all processed foods such as ready meals, fast foods, sweets and fizzy drinks and most people are totally unaware of its danger." While high fructose corn syrup is alternately marketed as the absolute defining reason formany health problems and as perfectly harmless, it makes sense for everyone to cut back on sugar and caffeine for a healthier diet without alarming and inaccurate facts.